Literally every muscle in my lower legs hurt, both front and back. I told myself they were growing pains from staying away from trails for two months and kept at it. I went to a nearby trail today to do a short hike/run. I knew it was going to be more hiking than running, and I had accepted that. I had the ankle break earlier this year, and I have also begun practicing yoga almost daily. My ankle still doesn’t have full mobility, and because of the yoga I have more lengthened muscles. Months after the injury occurred, I’m feeling unsure on my legs, especially on trails, afraid that I will trip and hurt myself again. On the rocky, uneven terrain, I feel like Bambi learning to walk. What I didn’t anticipate was the crazy pain that I felt in both legs below the knee, and both arches. It led to me proceeding as if I was performing a gym workout, with “sets” of minutes going up and recovery interspersed. It felt like hell, but I made myself go a mile and a half up and out before turning around and running down. Literally every muscle in my lower legs hurt, both front and back. I knew they were growing pains from staying away from trails for two months and kept at it. When I got home and did a core workout and SMR work on everything that was hurting. I’ll probably throw in a stability-plyometrics workout later this week, mostly to build up confidence. 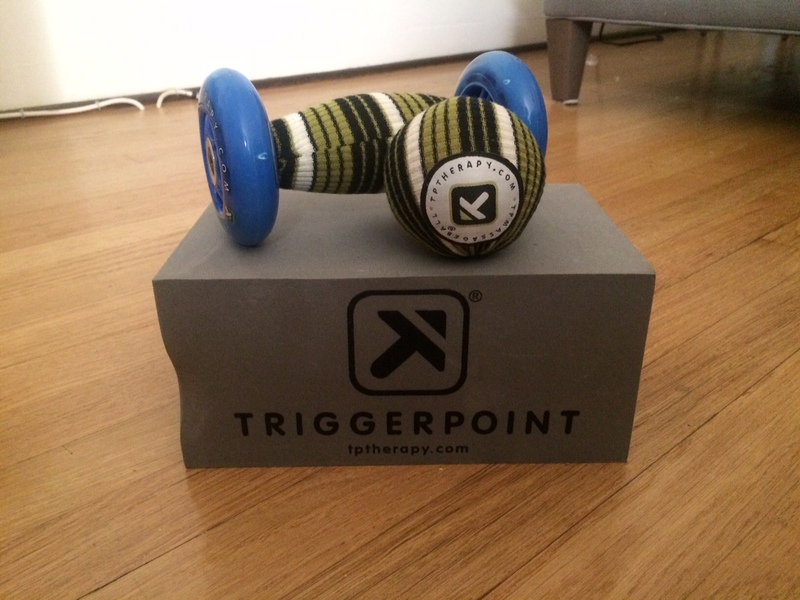 These things will make me stronger on the trails, which is where I find the most joy running. At least today I got a taste of being out there and feeling adventurous. “You’re not working hard enough! You’re slacking off! Push! Push!” The words were yelled to me by a man I had never seen before. He and another woman were waiting for Annie and I to pass them on the trail, so they could go back to diverting water from the stream into their backyard. He had the accent, and demeanor of an eastern European gymnastics coach, and I struggled not to take the command personally. Another morning, I might have responded negatively- not replied back, but let the words take hold in a detrimental manner. Not today. I’ve been trying to come back from an ankle fracture for months now. After building up to seven miles, I took a month off from running, but now I’m back to the point where I can do a solid four miles without much pain…above my waist. I’ve got shin splints on my left leg for what must be the first time in ten years. God, its annoying. I’ve invested in some cool toys to help get the kinks out, and they are working, but slowly. My high school cross country coach used to say “No one ever died from a side stitch.” I try to take that message with me when I am running and one of those bothersome aches comes on. I ask myself, “Will this kill me? Will running on it turn it into a bigger injury?” If the answer is no, which it usually is, I trudge on, knowing that pain is only temporary from years of experience. Sh*t hurts, but it’s worth it! Today my shin hurt, but the pain in the arches of my foot that had been coming with that pain had lessened. Progress. When the stranger yelled at me, I took heed. He was right, because I was slacking off. Even though we were mostly on trail, it was going to be less than a five-mile run, and I could push through the pain I was having for an hour or so. Annie was ahead of me on the trail. I caught up to her. Apparently she had received similar words of “encouragement”. I felt better. The mean man meant well. We finished strong, and I felt able to do even more mileage but was happy to be done for the day. 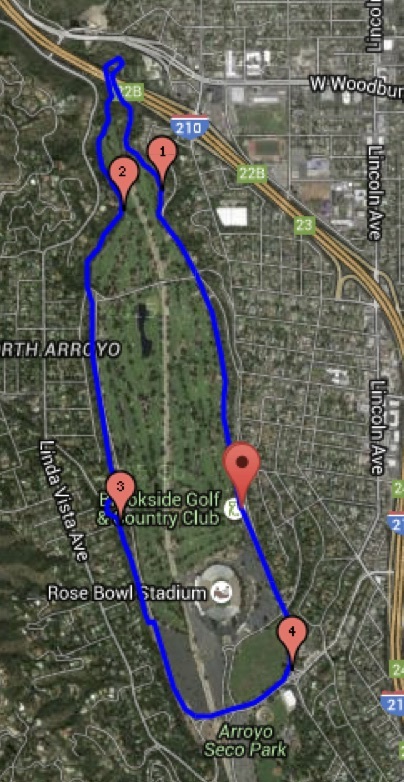 We ran the trail that borders the Rose Bowl Loop in Pasadena, cutting across a stream once we got to the ropes course and coming back by the golf course.